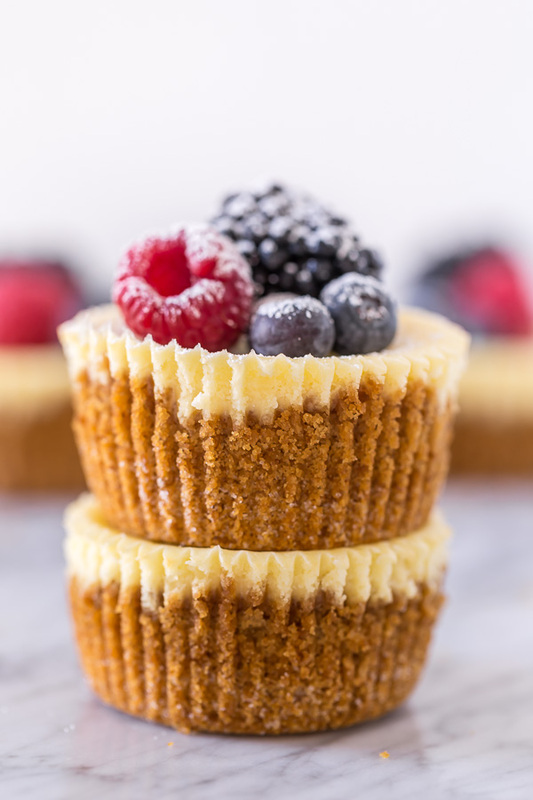 Mini Ricotta Cheesecakes are rich, creamy, and baked in a muffin tin! 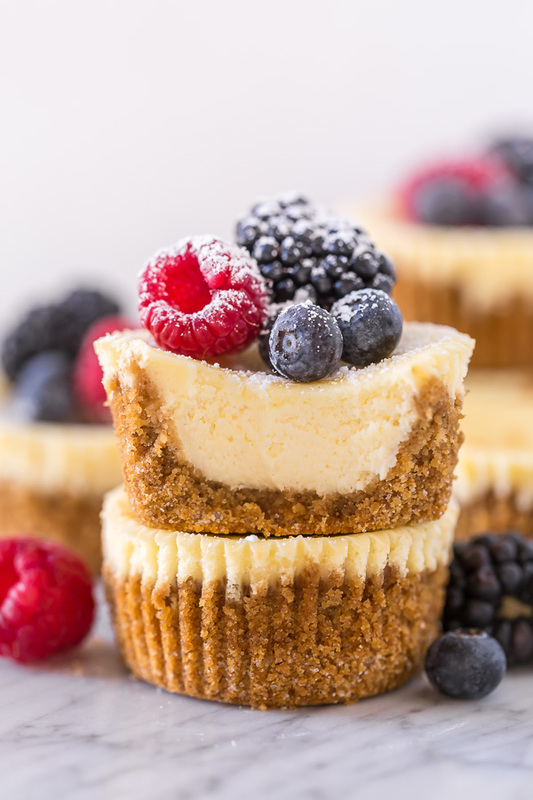 No water bath required for this mini cheesecake recipe. These little cuties are so perfect for parties and are always a crowd pleaser! Easter is quickly approaching and in our house that means one thing: Ricotta Cheesecake! We make one every year. But this year I’m shaking things up and treating my family to these mini ricotta cheesecakes. 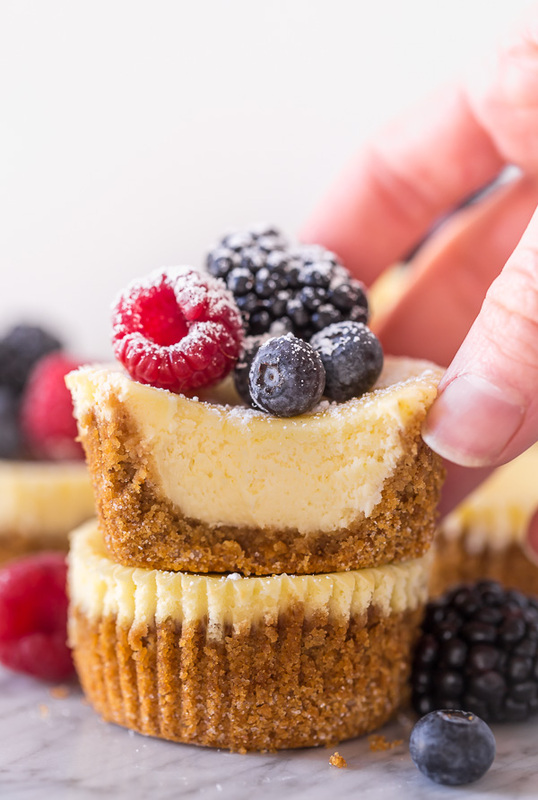 They’re just as creamy and flavorful as the original recipe, buy way easier than baking an entire cheesecake. Plus, their tiny size makes them perfect for sharing! 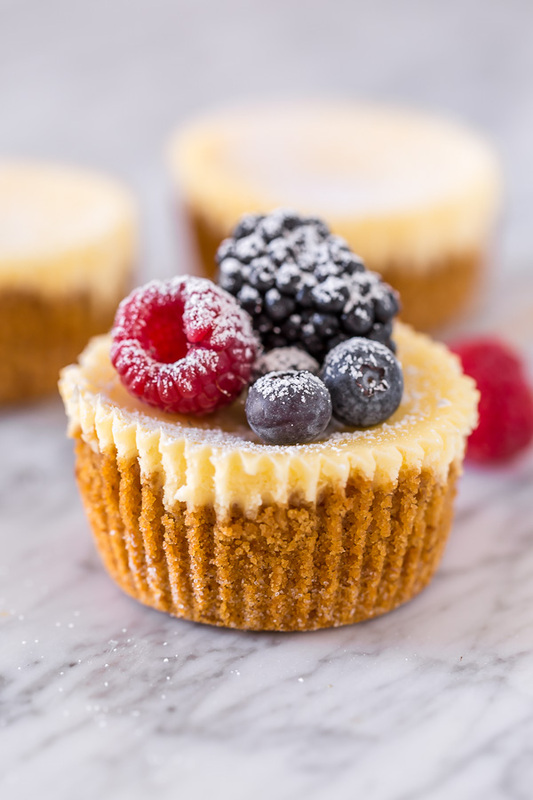 So if you love ricotta cheesecake, you have to try this mini version! Bonus: no water bath required! I know that little tidbit will make many bakers rejoice! and almost any variety of jam or jelly would be tasty!!! ricotta cheese: makes the cheesecake batter creamy, dense, and flavorful. Again, use full-fat. and finally, heavy cream: this makes the cheesecake batter creamy, creamy, creamy! do not substitute this with milk or even half and half. Oops! I almost forgot: you’ll also need graham cracker crumbs, butter, and sugar to make the crunchy graham cracker crust! You can make your own graham cracker crumbs by crushing sheets of graham crackers in a blender or food processor. Or, save yourself the extra step and buy them pre-crushed at the grocery store. 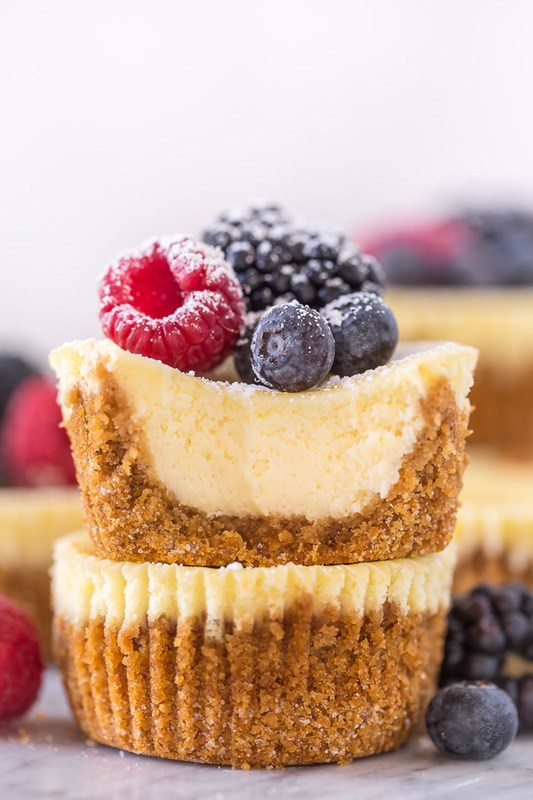 This recipe yields one dozen mini ricotta cheesecakes, but the recipe doubles like a dream. You can also make this recipe up to 5 days in advance!!! Making it perfect for parties and celebrations. I made 5 dozen of them last week for a family event and let me just say being able to make them in advance was a life saver! Preheat oven to 325 degrees (F). Line a 12-cup muffin tin with paper liners, lightly spray liners with non-stick spray and set aside. In the body of a blender or food processor, combine graham crackers, sugar, and salt; pulse until the crackers have been completely transformed into fine crumbs. Add melted butter; stir well to combine. Add 1 heaping tablespoonful to each lined muffin cup. Press the crust firmly into an even layer. Bake in preheated oven 5 minutes then remove from oven and set aside to cool. In the meantime, make your filling. Reduce the oven temperature to 300 degrees (F). 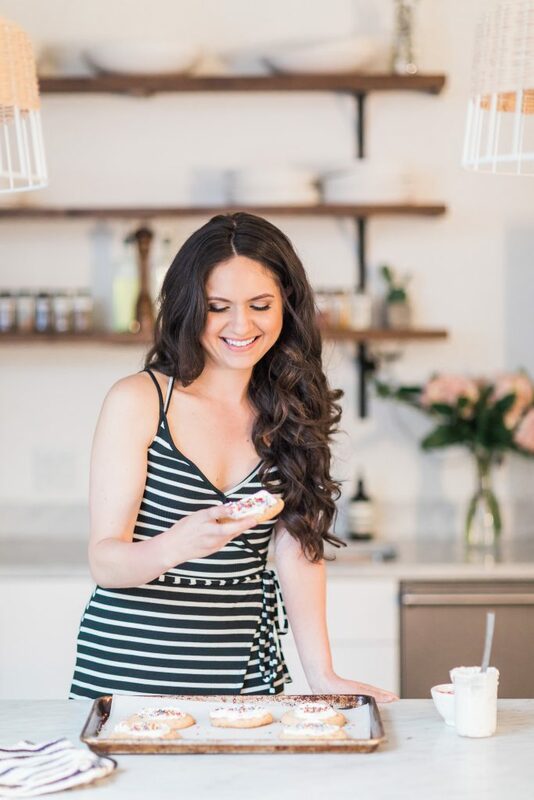 In the body of a high power blender, food processor, stand mixer fitted with the whisk attachment, or in a large bowl using a hand held mixer, beat the softened cream cheese and Ricotta cheese until smooth. Add sugar and vanilla and beat smooth, scraping down the sides and bottom of bowl as needed. Add in the eggs and yolk and beat until combined. Turn the mixer off and, using a rubber spatula, gently stir in the cream, mixing until evenly combined. Divide the filling evenly among cups, pouring it on top of the prepared crust layer. The molds will be very full. Bake in preheated oven for 15 minutes, then turn off the oven and leave the door closed for another 10 minutes. Remove the pan from the oven and place the pan on a wire rack to cool completely. 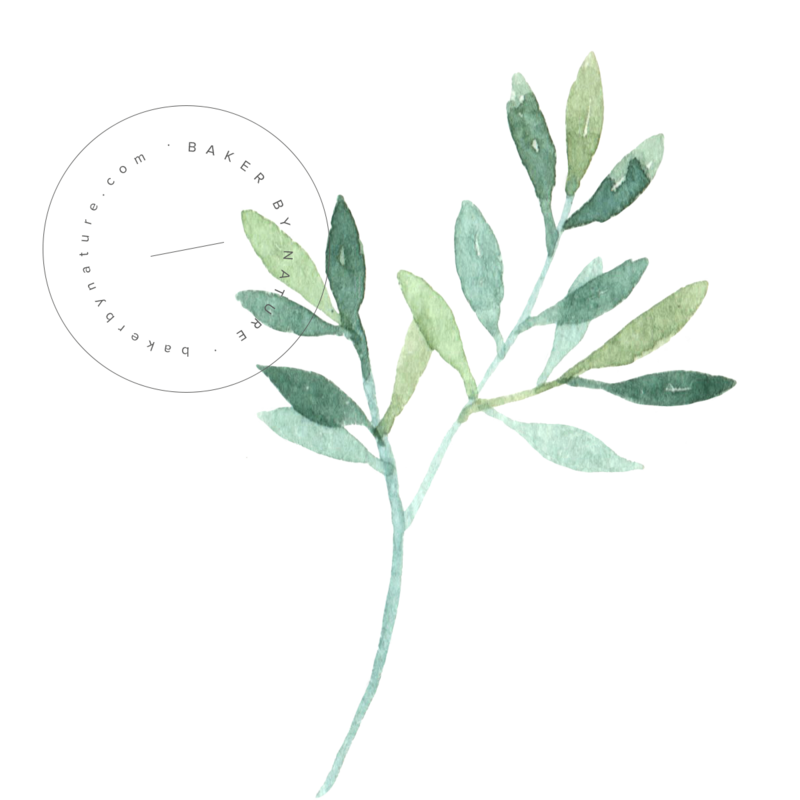 Once cool to the touch, place the pan in the fridge to chill for at least 2 hours. Once the cheesecakes are completely cool, you can remove them from the pan. Store in the refrigerator, in an airtight container, until needed. Cheesecakes will keep for 5 days. I want to make these in my mini muffin pan for a party. Ever tried this? I guess I should lessen the time a little? Hey! They seemed a bit too liquid after only 15 minuets baking …. is that how it’s supposed to be?